Regular reader(s) will know that I am not averse to starting a list. The Robin Hood Trail. The Yorkshire Three Peaks. 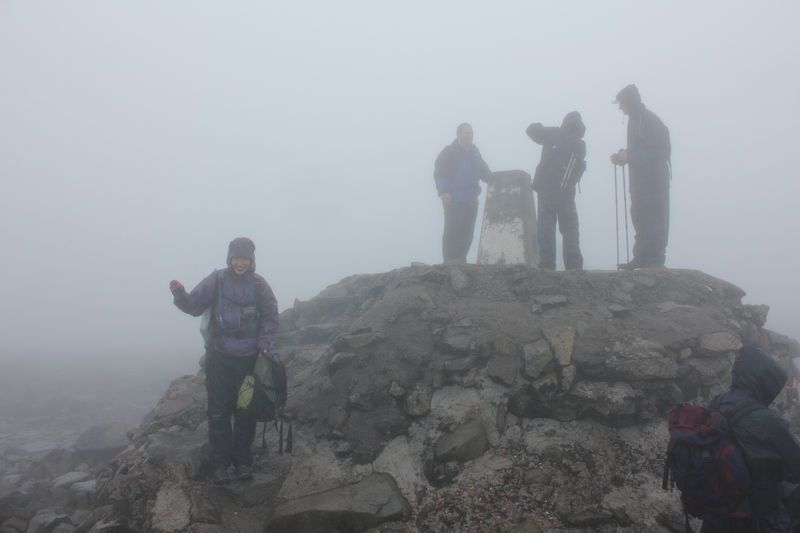 As we hiked up Ben Nevis last June on what seemed like the busiest day of the year, it seemed the most obvious thing to do to propose completing the proper Three Peaks. I mean, some of the people we saw on the Pony Track look like they only ever walked from the car to the desk at work and back again – how hard could it be? 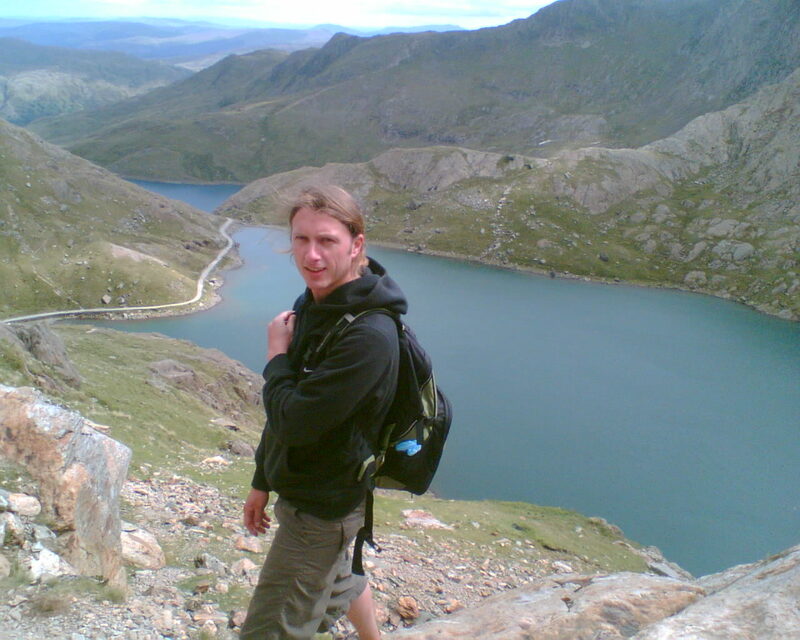 And so I am able to confess that, while the Wikipedia entry says most people have to climb the three highest hills in Scotland, Wales and England within 24 hours, it has taken us a little longer – almost six years. 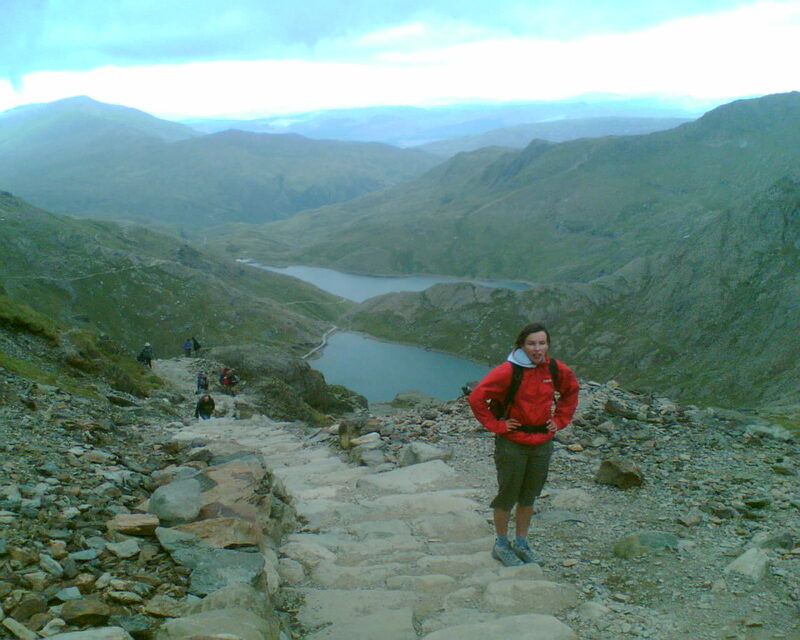 I am loving walking up Snowdon. When can I have a biscuit? Our tale starts in 2007. I can tell that by my haircut in the pictures – an unexpected advantage that I have over Dave. We’re married, but only by a couple of months, and we decide to take a break from the seemingly endless house renovations to go to North Wales, and go camping and hiking. For some reason, the fact that the August bank holiday has just passed doesn’t loom onto our mental horizons, and so we are surprised to arrive in Betws y Coed to find the place PACKED. We end up pitching our tent in a corner of a busy field, and after a good pub meal, we stumble towards Snowdon next morning. We are armed with a thermos of tea, and a full packet of ginger nut biscuits. Although we’re not exactly experienced walkers by this stage, and the weather is good (for August in Wales), we are still surprised to see families setting off up the PYG track wearing flip flops and carrying plastic grocery bags with what looks like a full picnic, possibly including cutlery. I think that I’m in relatively good shape until the going gets steep, and I find myself ‘enjoying the view’ (aka stopping to rest) quite a lot. Dave takes to tempting me up the trail with the promise of another ginger nut biscuit. We make it to the top without incident, where the summit is crowded with tiny tots, the elderly and the infirm. We feel we have achieved a great deal and head back to our campsite to sit in an uncomfortable folding chair next to the car, and drink wine. Fast forward to 2012, and we’ve climbed all sorts of hills, and travelled to far off lands – but I have still only been to Scotland once. That was on a trip to Edinburgh while we were still students. For someone who professes to love the hills, my experience of Scotland is entirely lacking, so we agree to head north for our traditional ‘birthday and anniversary’ jaunt. We stay in a tiny cottage which comes complete with a Finnish barbecue hut. It turns out that this is basically a glammed-up hexagonal garden shed, with a barbecue and fire pit in the middle. It also turns out that this is the most amazing invention since midges first hatched, and I hereby decree that everyone in Scotland who has a garden should get one. 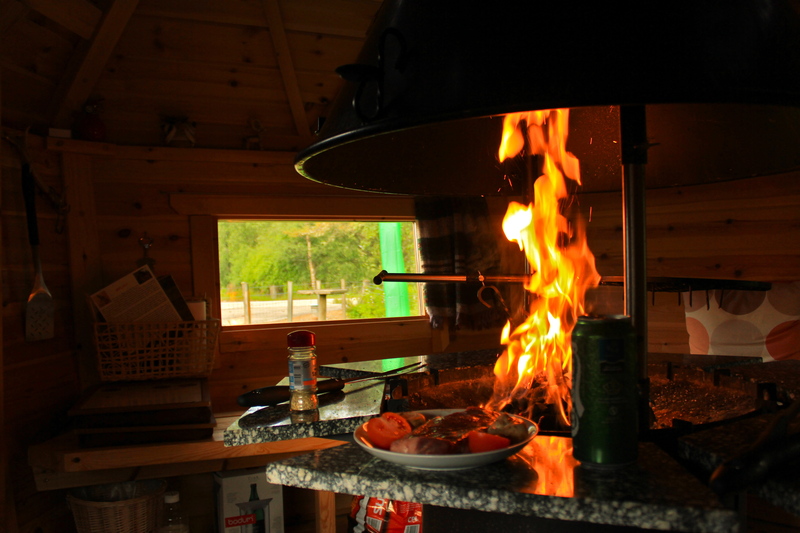 Dave enjoyed his indoor-barbecued Scottish steak. 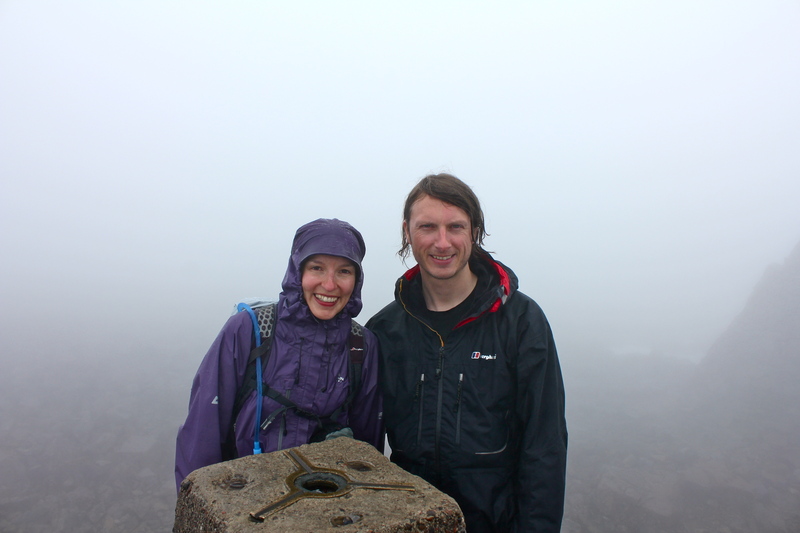 For our wooden wedding anniversary, we venture into the land of stone and take to the paths of Ben Nevis. In a development that may sound rather familiar, we take no notice of the calendar being adhered to by the rest of humankind, and so are surprised to arrive in the car park at the foot of the Pony Track and find it jampacked. Why are all these minibuses parked with their engines running? Of course, we’re setting off up the traditional starting point for the Three Peaks challenge, at the beginning of the longest weekend of the year. For anyone trying to climb all three within 24 hours, this offers the best chance of getting plenty of daylight, and explains why the Pony Track is like Piccadilly Circus despite the driving rain and low cloud. 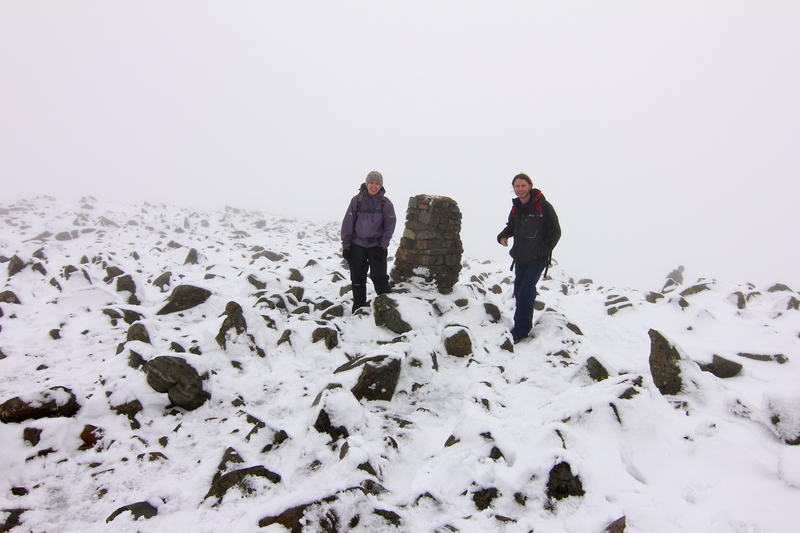 I didn’t expect blue skies and sunshine – but I was a bit perturbed to discover snow near the top. Look at us all celebrating that we’ve reached the highest point on the UK mainland! And we can’t see a thing! It’s on this walk that we begin to understand what a big deal the Three Peaks is. People are wearing special team t-shirts; knees and ankles are being turned; there is even sobbing (and for once, it isn’t me). Suddenly it becomes important that we finish a challenge that we didn’t even realise we’d started. We climb out of the valley on the straightforward Wasdale Head route. I’d borrowed my mum’s Wainwright guidebook, and perused the various options: perhaps a long circular walk also taking in Scafell? 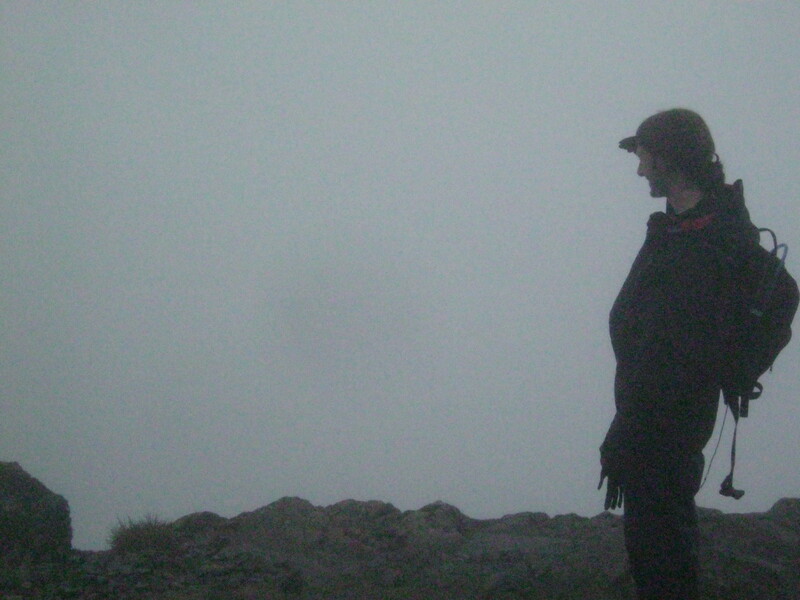 Perhaps we could reverse my plan of a few years back, and descend via Great Gable? Or perhaps we could just make life easy for ourselves, and climb England’s highest mountain via a clear and straightforward path, and get back in time for a cup of tea and a hot bath. In a change from the usual routine, we make life easy for ourselves. 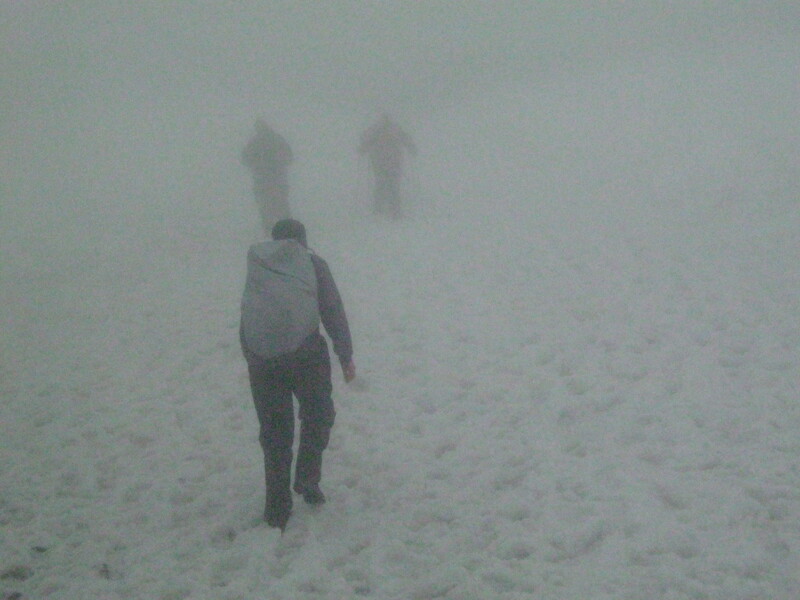 The summit disappears in a thick bank of cloud; we trudge onwards and upwards, looking slightly enviously at the other walkers who are donning crampons as the path is submerged beneath snow. A tiny bit of map reading; uphill from Lingmell col, passing the ever-present batty fellrunners, before suddenly finding the summit shelter. Another summit! Another non-existent view! This time England’s highest hill. After nearly six years, we have finally made it. The haircut has changed (again); some of the gear is a bit better (I’m not wearing trainers and shorts this time). I don’t need bribing with biscuits – in fact, crisps are now my snack of choice when hillwalking, as they are easy to cram into your mouth when sheltering from howling wind or driving rain, and they don’t get soggy in the bottom of your bag. We haven’t broken any records, or raised any money, but at least we’ve challenged ourselves a bit, and we’ve had some experiences that I won’t forget in a hurry. Time to start a new list. 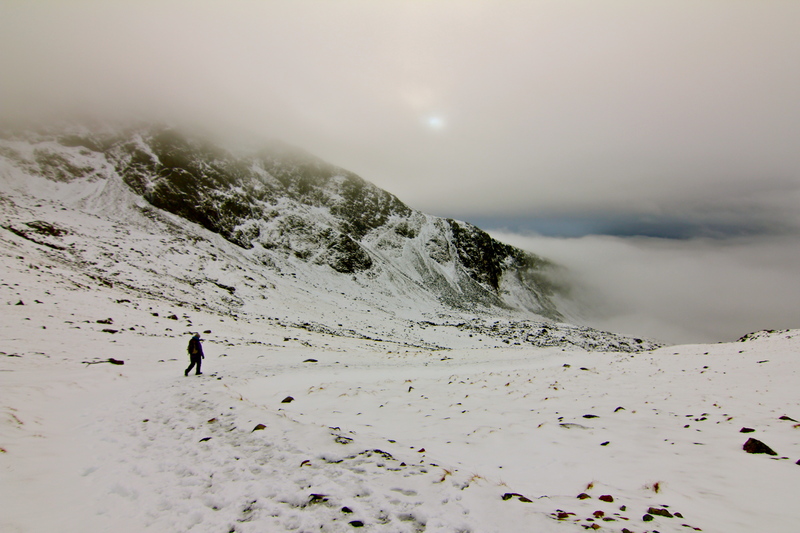 The sun tries to peak through the cloud as we descend from Scafell Pike. 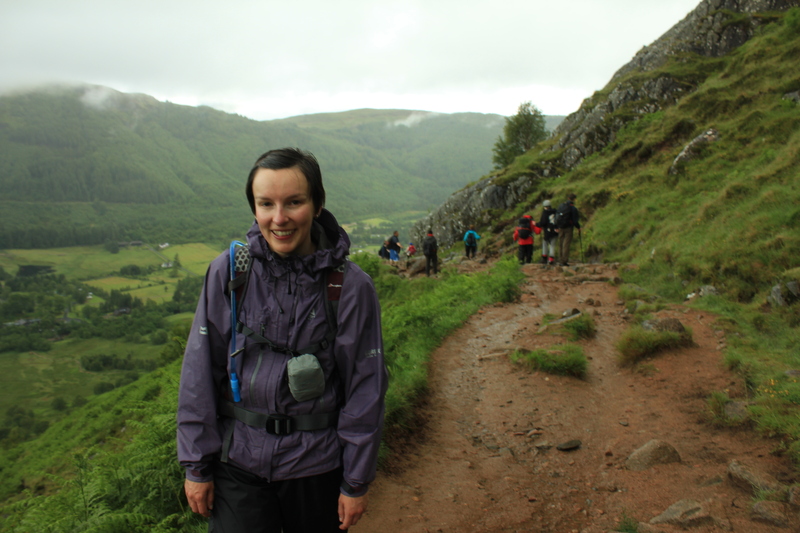 Tags: 3 Peaks, England, hiking, Scotland, Three Peaks, Wales, walking. Bookmark the permalink.